Use the dropdown menus to select the products you wish to export (or leave them all on the default to export all products), then choose a file type and click 'Submit'. 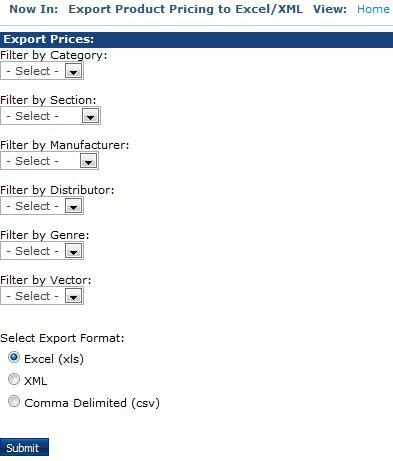 Once the file is created, you can edit the Price values and re-import the file through the Products → Import/Export → Import Prices from Excel/XML page. Note: If you export prices from products that came from a root category that has a sub-category, it will not export the details for products that is in the sub-category. It will only export details of products under the root category. So if the root category does not have any product, there will be no details in the file. You have to export the prices from the sub-category itself to get those data.